Takuma has a home! 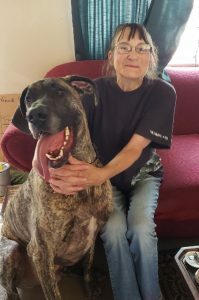 - Rocky Mountain Great Dane Rescue, Inc.
Takuma has a home with his new family in, Colorado Springs, CO! Tamara has owned Great Danes for over 30 years, even having a deaf Dane that she taught sign language to! She has adopted from us twice before, and sadly lost her Dane a little over a year ago. She was ready to add another one to her home, and saw Takuma on the website. Tamara is retired, and is able to be home all day with Takuma. They will enjoy walks in Tamara’s large yard, and he will go with her on errands and outings. Takuma will be the only dog in the home, but will share his home with a 24 year old cat named Boss. Takuma has a life of constant companionship and couch snuggles to look forward to! We are so excited for Tamara and Takuma! Way to go sweet boy!